Whether you are an octogenarian human rights activist, a working mother, a twenty something surfer or still at school, the government undoubtedly has information that is useful to you and many people like you who share your interests. But am I allowed to access it? 30 years ago Australia enacted a law which changed everything, the Freedom of Information Act 1982 which gave everyone the right to access government documents. Behind the scenes it took the passion and dedication of politicians, public servants and activists more than ten years to make this happen and we became one of the first countries to enshrine these rights of access in law. This is absolutely something to celebrate! If you wanted to ask the government for information in the past it could be hard to know where to start. That’s because today we’d like to introduce you to Right To Know. 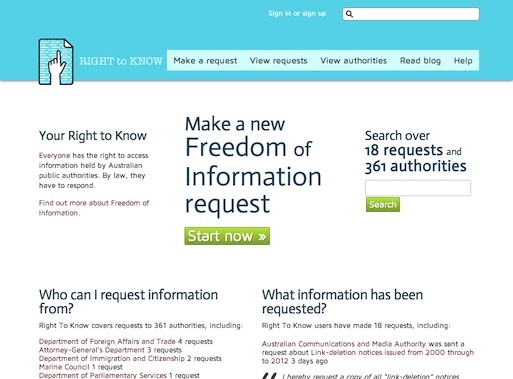 With Right To Know we’ve made it simple for you to ask the government for information you think is important. On the site you’ll find really easy to understand instructions every step of the way, and there are people there who can help. You can also see how other people have worded their requests and see what information they received. A huge thank you to all the people who helped to make this happen over the last few months. Go ahead ask for information. It’s your right to know.